Carthage Mills' FX-HS Series of nonwoven geotextiles are often times considered 'multipurpose' geotextiles as they can offer immediate and cost effective solutions for many separation, drainage, erosion control and filtration applications. Carthage Mills' FX-HS Series of nonwoven geotextiles are constructed of 100% polypropylene staple filaments that have been needle-punched and heat-set for stability. Weights range from 3 to more than 30 ounces per square yard. Carthage Mills' FX-HS Series of nonwoven geotextiles exhibits high durability with excellent resistance to puncture and tear, yet easily con-forms to the ground and site irregularities for trouble-free installation. The Carthage Mills' FX-HS Series of nonwoven polypropylene geotextiles are designed to provide cost-saving solutions with most soil types in a wide range of applications and varying site conditions. With superior soil-retention the HS Series prevents dissimilar materials from inter-mixing thereby extending the system life and performance of most drainage/filtration applications. Excellent soil retention and high permittivity properties provide high water flow rates with most soil types. Provides excellent resistance to installation damage and adverse site conditions. Combining the FX®-HS Series features of Separation, Soil Retention, High Permittivity, and excellent Durability, the HS Series provides cost-effective solutions in a wide range of applications. 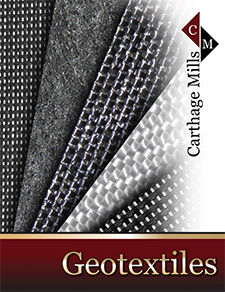 Carthage Mills' FX®-HS Series of nonwoven geotextiles can be used in a multitude of applications. Subsurface Drainage applications or systems along highways, under airfields and athletic fields, and within embankments.